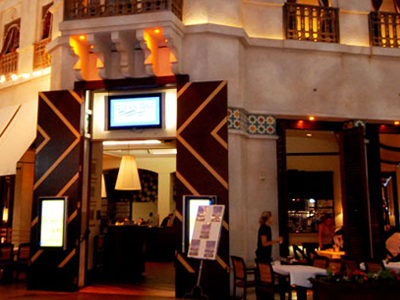 Take a break from the daily grind of Vegas and stop in to Ocean One Bar & Grill for a relaxing repast. Your classic cafe options of burgers, salads and sandwiches are available, in addition to daily specials. A wide variety of flavors of martinis are offered for your enjoyment from fruits to nuts, sour to sweet. Not interested in a martini? No problem, plenty of beer and other options abound. Meet your friends or mingle with new ones at Ocean One because it’s a great place to be. Offering daily breakfast and lunch specials at great prices. Ask to sit by the windows for a view of the indoor rainstorm. Famous for the 3-for-1 all day happy hour. Came for lunch on a Sunday. Happy hour prices all day, $5.99 menu. Staff was very nice also. Great value for the price!